Portuguese CMMS software is widely is used in Brazil, Portugal, Mozambique, Angola, Guinea, Cape Verde, and other industrialized countries. Unfortunately many of these systems are inadequate when it comes to reporting and analysis of CMMS data. 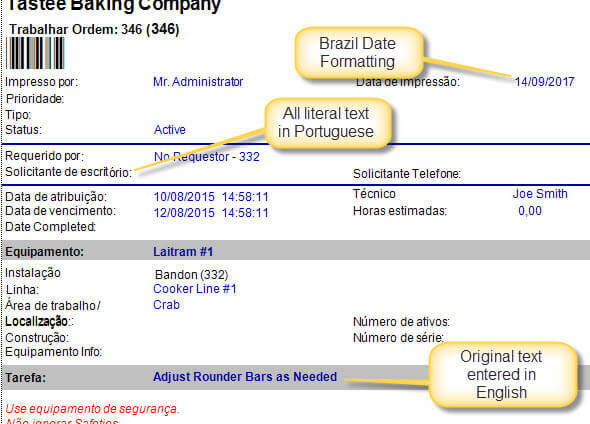 In this example Portuguese is used for the CMMS translation, however this applies to any language. Some of the more popular CMMS translation are: Spanish, Russian, Chinese and Arabic. Besides simply translating the text the software also uses the regional setting for the country and culture where the translated CMMS is being used. The implications of this are that the currency symbols, decimal separators, and most importantly date format are automatically used throughout the software and reports. The result is a customized CMMS that fits everywhere in the entire world. 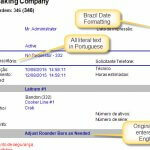 Login to the CMMS software using Portuguese language settings. All text, reports and messages immediately translate to Portuguese. The items (in the picture on the right) in red are the translations available in the demo program. When a new translation is created by the user it also displays as red text in the language selection drop-down box. The CMMS loads your personal font and color settings. Other default settings such a personal printer selection are loaded. Work orders and preventive maintenance assignments may be restricted to only the logged in user's work. Translate all literal text, report text and message text to the language of your choice. We provide several Google translations that may be edited as needed to provide a very accurate translation. The video (above right) instructs on this topic. Additionally we encourage you to contact us for a free, no obligation online demonstration of the CMMS translation tool. Request a personal online demonstration of the CMMS translator in action.